Every two years, the Royal Architecture Institute of Canada (RAIC) and the Canada Council for the Arts announce winners of the Governor General’s Medals in Architecture. The medals recognize excellence in design by Canadian architects across the country. Two of the twelve projects honored included LiveRoof brand green roofs as prominent features. Nathan Phillips Square’s Revitalization project, a collaborative design effort of PLANT Architect Inc., Perkins + Will Canada, was recognized for redesigning the civic space at Toronto’s City Hall. The design team also included Hoerr Schaudt Landscape Architecture, and Adrian Blackwell Urban Projects. This project also received a 2016 National Urban Design Award. Bridgepoint Active Healthcare, the first LEED Silver hospital in Toronto, also earned this prestigious honor. The design team included architects from Stantec Architects, KPMB Architects, HDR Architecture and Diamond Schmitt Architects. The project also received an international 2016 Civic Trust Award. Bridgepoint Active Healthcare was awarded a 2016 Civic Trust Award from the UK based built environment awards program. The LiveRoof green roof was highlighted as one of the key factors in selecting Bridgepoint for the award. In addition to the vegetated roof, a meditative labyrinth, a therapy pool, and windows that provide the bedridden patients unobstructed views were also mentioned as contributing to Bridgepoint’s selection. Diamond Scmitt Architects, Stantec, KPMB and HDR designed the award winning building. The building is the only award winner from Canada and there were only two other winners throughout North America. In addition to this award, Bridgepoint was awarded a National Healthcare Design Award from the AIA and a Best of Canada Design Awards. To get an aerial view of the project watch this short video. APPLETON, WI – St. Elizabeth Hospital, continuing its commitment to providing person-centered care in a sustainable manner, is putting the final touches on its third planted roof. Contractors are wrapping up the installation of a 6,110 square-foot LiveRoof® system atop the new Fremont Tower which began earlier this week. The first 4,125 square foot green roof was installed on the Heart, Vascular and Lung Center building in 2009. This building received LEED Gold Certification in recognition of its sustainable design and operation. The hospital also installed a 3,000 square-foot vegetated roof on its Cancer Center in 2011. Finishing touches are being put on the third green roof of the Appleton campus at St. Elizabeth Hospital. St. Elizabeth Hospital is part of Affinity Health System, Ministry Health Care and Ascension. The hospital’s organizational value of wisdom calls its staff to be responsible stewards of natural resources. The new 5-story building at the Hospital was designed with a sustainable approach, and embodies this value. The building has many sustainable features, including efficient mechanical systems, use of passive solar energy, and low-flow faucets, toilets and showers. The building also has ground-floor and rooftop gardens, which benefit patients and the environment. “When we planned the new building, we wanted to create a restful place for patients to heal and a great place for associates to work. We also wanted the building to be sustainable, so we deliberately planned and constructed the building in this way,” explains Iqbal Mian, a Lean Leader who focuses on sustainability efforts at Ministry Health Care. 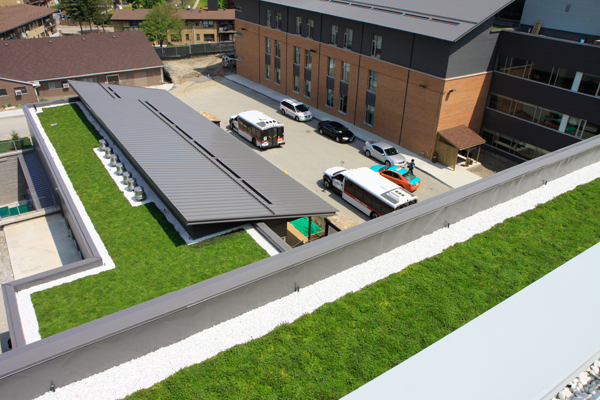 The new rooftop garden was designed by Hamill Green Abrahamson, the architects for the project, and will be installed by Crafts Inc. Bachman’s Inc. of Minneapolis, Minnesota custom grew the green roof system as the regional LiveRoof licensee. Green roofs provide nature function and beauty. A patented, subterranean modular system unites the soil and plants creating a naturally beautiful meadow-like aesthetic. The roofs provide aesthetic, environmental and social benefits. Financial benefits can also be achieved from a vegetative roof including: extension of roof life, energy conservation, enhanced public relations, and conservation of municipal septic systems. (See our Green Roof Benefits Page). Mercy St. Vincent Medical Center is now housed under a green roof of lush plants. Many patient rooms face the 2,500 square-foot rooftop terrace green roof, which features a courtyard for the exclusive enjoyment of patients and their families. 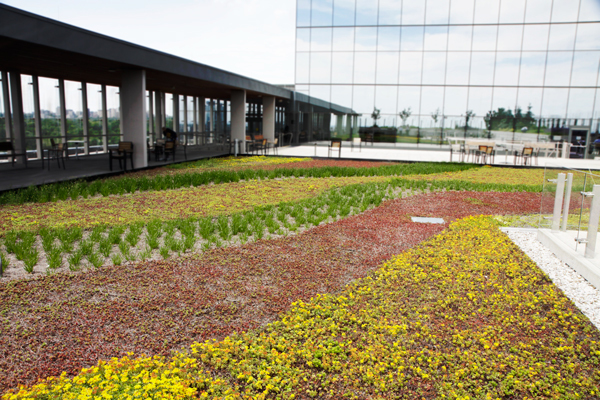 The LiveRoof® Hybrid Green Roof System was selected for the terrace green roof, which was installed by Advanced Roofing Services with the plants grown by Corso’s Perennials. 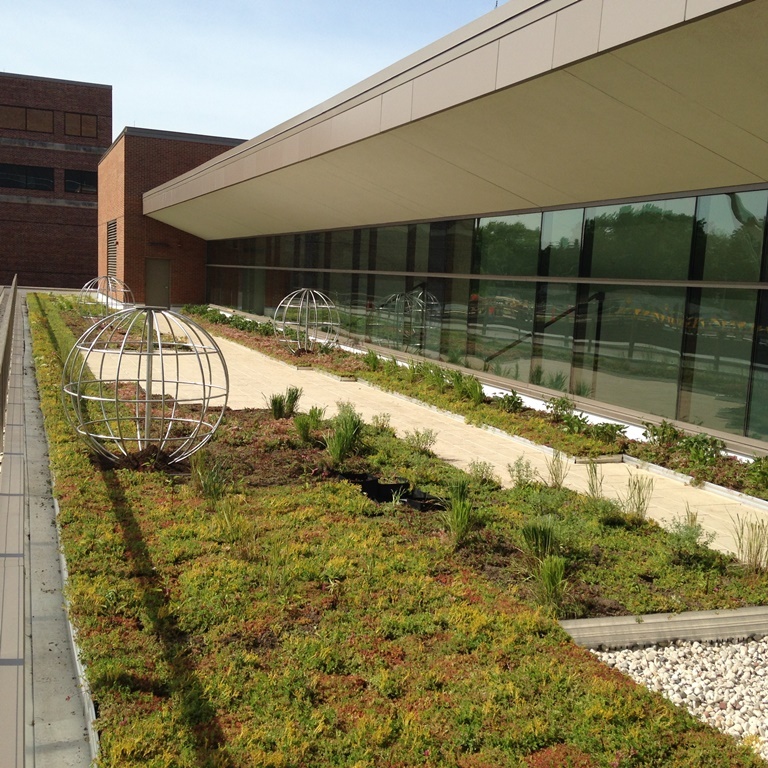 St. Vincent Medical Center in Toledo, Ohio features a new green roof which is visible to patients, visitors and staff. Patients and their visitors can see the park-like setting from over 84 patient rooms, multiple waiting rooms, and visitor lounges. While most renovations are focused on improving work flow or updating areas, this renovation stemmed from a desire to provide naturally healing and calming space for visitors, patients, and staff. “With the completion of the rooftop garden, I believe it will reduce stress with our employees and improve the outcomes of some of our patients, while improving the experience for all patients and their families. This will be a place to relax and enjoy a tranquil distraction within our complex,” expressed Jennifer Yockey, an MSN, CIC Infection Control Nurse with Mercy St. Vincent Medical Center. “We delivered the LiveRoof modules full of regionally adapted and locally cultivated plants that were mature, thriving, and ready for the rigors of the rooftop environment,” said Gus Corso, owner of Corso’s Perennials (Sandusky, OH). Corso’s Perennials is LiveRoof’s licensed regional grower and distributor for western Pennsylvania, Ohio, and West Virginia. Green roofs, or vegetation on roofs, offer many benefits, including, beautification, water management, air purification and an increase in energy efficiency. “In addition to the benefits to the patients, their families and staff, the roof will help reduce noise pollution, minimize water runoff and provide a wildlife habitat for birds and bees. These systems will be enjoyed by generations to come,” said Dan Cartell, LiveRoof sales representative for Corso’s Perennials. The LiveRoof system greens other rooftops of Mercy facilities. “Our sister hospital, Mercy St. Charles, has installed these roof top gardens with success, on multiple roofs at their facility. We used this concept with the additional thought of human interaction, and came up with a great location,” said Kwapich. Mercy is a member of Catholic Health Partners, the largest health system in Ohio and one of the largest non-profit systems in the country. Locally, Mercy is based in Toledo, Ohio and serves 22-counties in Northwest Ohio and Southeast Michigan. Mercy provides comprehensive primary and critical care services to residents and operates seven hospitals strategically located throughout the region as well as Life Flight critical air transport services and Mercy College of Northwest Ohio. mercy is composed of Mercy St. Vincent Medical Center, Mercy St. Charles Hospital, Mercy St. Anne Hospital, Mercy Children’s Hospital, Mercy Tiffin Hospital, Mercy Willard Hospital and Mercy Hospital of Defiance. In 2012, Mercy was proud to provide $86.5 million in community benefit. With more than 7,300 employees and 2,500 medical staff members, Mercy has been a part of the communities it serves for over 157 years. Please visit mercyweb.org for additional information regarding Mercy. Founded in 1941, Corso’s Flower & Garden Center is a family owned and operated business in Sandusky, Ohio. Originally a retail greenhouse, it now includes 14 acres of greenhouse, 15 acres of outdoor production, and a retail flower shop, garden center and landscape department. To increase wholesale production of perennials, the company has expanded to a second location with 70 acres of farmland in Castalia, Ohio. Corso’s Perennials, the wholesale division, grows over six million plants annually to supply perennials to a five-state area. Corso’s Perennials serves as the LiveRoof licensed regional grower and distributor for Ohio and parts of Pennsylvania and West Virginia. Based in Spring Lake, Michigan, LiveRoof, LLC is the top horticultural science company in the green roof industry. Exceptional in design and function, the LiveRoof® Hybrid Green Roof System is the most refined horticultural solution. LiveRoof establishes a healthy, sustainable ecosystem covering rooftops with seamless vegetation. Licensed regional growers customize plant selection for every LiveRoof project. They deliver the system’s modules abundantly vegetated with locally cultivated, full-grown plants for an instant green roof and trouble-free ownership. LiveRoof’s natural function and natural beauty offer the highest level of green roof performance with ultra-low maintenance costs. The proof is on the roof – showcased in over 800 installations that total more than 3 million square feet. Why are Healthcare Providers Buying Green Roofs? 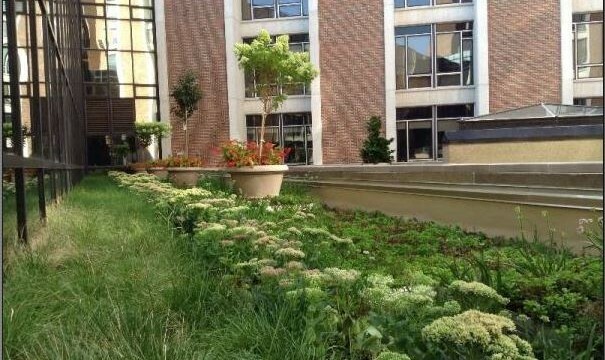 The LiveRoof® brand green roof system installed on the Rush Copley Medical Center was installed in June 2011 by Anthony Roofing, a Tecta America Company.